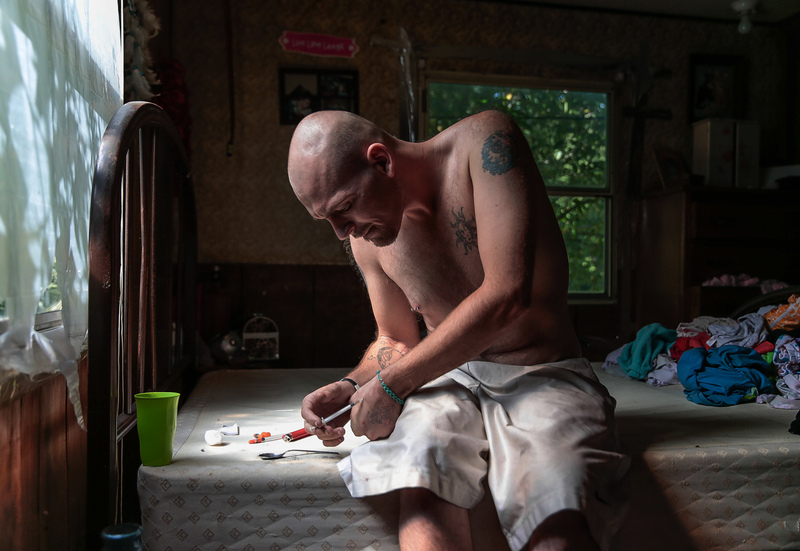 August, 29th, 2014, East Liverpool, Ohio, United States, : Ryan shoot's up heroin in his home. Heroin use in America's rust belt is a plauge that is affecting many small towns like East Liverpool. Crime and heroin overdose is common as addicts will do anything to maintain their habit and to avoid getting, " sick, " or feeling the intense pain of withdrawing from the drug. \n\n The initial effects of heroin include a surge of sensation—a “rush.” This is often accompanied by a warm feeling of the skin and a dry mouth. Sometimes, the initial reaction can include vomiting or severe itching. After these initial effects fade. the user becomes drowsy for several hours. The basic body functions such as breathing and heartbeat slow down. Within hours after the drug effects fade, the addicts body begins to crave more.